The opening ceremonies of the Olympic Games are always an emotional and uplifting event. The Sochi opening was no less spectacular than any previous opening ceremony, and, regardless of hotel and bathroom issues, the Russians did a simply exceptional job. After a late night in front of the TV, I woke up this morning to the opportunity of listening to TED Talk speaker Richard St. John on CBC satellite radio. 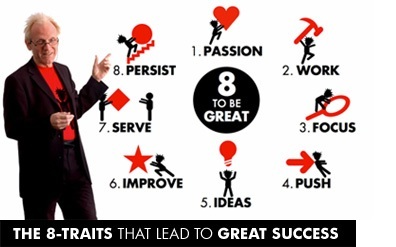 St. John is the author of The 8 Traits Successful People Have in Common and was being interviewed in light of the Olympic games and its athletes. Both events got me to thinking (stay with me, here). We have, en masse, the best higher education system in the world. And I’m not talking just the US. Canada, as well, has many top-tier universities and community colleges. In fact, the US boasts 47 of the top 100 institutions in the 2013-14 Times Higher Education Rankings, including 7 of the top 10 and 22 of the top 30. Canada has 5 institutions in the top 100, which, if you account for size, is equivalent to the US. Together, they fill over half of the top 100. Not bad (if you don’t mind the data issues with the ranking systems, which are significant). One must look at Olympic athletes in awe. Every one of them has a level of dedication that most of us can hardly understand. Working for years trying to get better at a very intense and difficult task. For many, this required training since they could walk. Some of the athletes are professional; many are still amateur, primarily because they can’t really earn a living in their sport. These people are perhaps the most dedicated of the Olympic scene since this is hardly their livelihood. I’m thinking that the ski jumpers, cross country skiers, and biathletes aren’t raking in quite the same level of coin that the NHLers are. Last night they introduced Nepalese cross-country skier Dachhiri Sherpa (doesn’t that name fit for a Himalayan! ), the only representative from Nepal, and who had to take four months leave from his bricklaying job to prepare for the Olympics. That spells both dedication and sacrifice. So what’s the message here for higher education, and how do our higher education professionals place in all of this? If our institutions are “that good,” as defined not only by international rankings, but the spinoff research, business, and creative spinoffs derived from higher education, what are we learning from them? Do these institutions follow the eight secrets? I’m not sure. I do know that some faculty and staff surely do. I’ve seen it countless times. If I take the antithetical viewpoint of this discussion, I can assuredly say that I’ve seen too many people at our higher education institutions that do not collectively share the passion, work ethic, focus, and creativity of the successful. Perhaps part of the reason is that our higher education system, incredibly bureaucratic as it is, dampers enthusiasm and creativity. Even at the top institutions I’m sure this holds true to a certain level. We’re talking about large, multi-million and sometimes multi-billion dollar corporations that serve over 17 million students in the US each year. This isn’t one-off stuff. And, in my much-used (ad nauseum) quote from Art Levine and Jana Nidiffer, the goal of successful institutions is to treat students in a retail—not wholesale—fashion. Individually, not just as a cohort. We do pretty well in higher education. I don’t want to discount that. But perhaps we need to get out game up a notch or two. Perhaps, especially in this economy, we need to be a bit better than we were yesterday. Just serving students isn’t Olympian enough. We need to improve how we teach, improve how we create our programs, and connect with the outside world of business, industry, and humanity to really make a difference in our society. We make a huge mistake focusing on quotas and numbers. These are lives we’re talking about, and not just students. These are our children, our grandchildren, and the millions who will follow. It isn’t just a job we do. It’s about propelling a nation to take advantage of unique and wonderful opportunities that we don’t even know will exist in this century. This is important work. What can we learn from St. John’s secrets of success? Think about it. Now is as good a time as any for an Olympic effort. do it for love not for money. if you do it for love the money will follow. passions are the first thing you thing of in the morning and the last thing you think of at night. success rarely comes without hard work; lucky winners are few and far between. concentrate all your efforts into one or two goals. without focus your resources will be too thinly stretched to achieve real success. listen; observe; be curious; ask questions; problem solve; make connections.